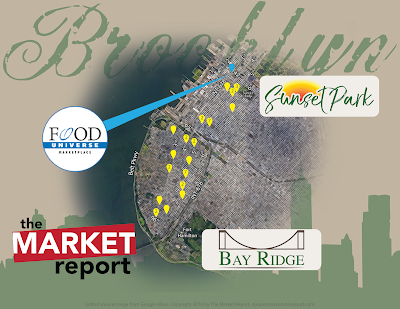 Our first Brooklyn stop is the Food Universe Marketplace in Sunset Park. It's located at the corner of 3rd Ave and 42nd St. One note about street numbering, notice that, unlike in Manhattan, the numbers increase as you go south, not north. So we go from about 42nd St on the north end to about 96th St on the south end. This Food Universe is in a primarily industrial neighborhood and is actually right under the interstate highway. So it's very noisy around here, and the construction in the street didn't help either. This Food Universe was previously a Clarimar Supermarket, apparently a longtime independent supermarket that was supplied by Associated Supermarkets. Clarimar in 2013 courtesy of Google Maps. 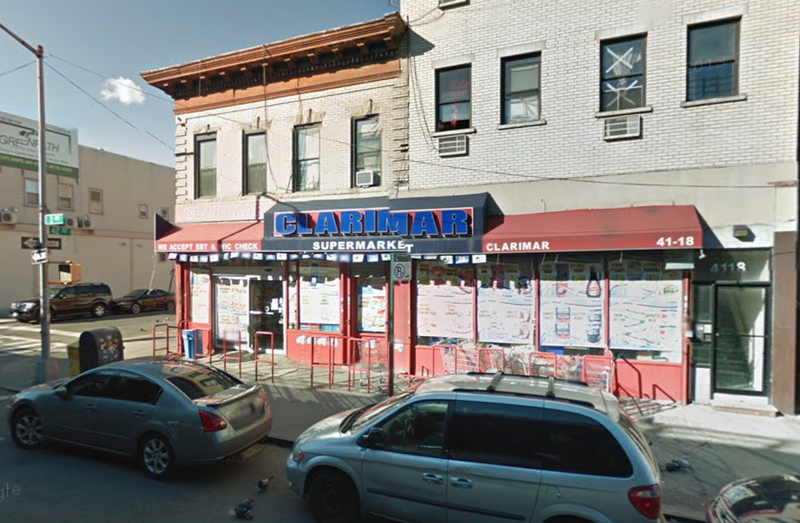 In 2015, Clarimar was sold to Brooklyn Farm's, a grammatically-challenged Associated-turned-Shop Fair operator. The store became a Shop Fair using the name Brooklyn Farm's, but closed by the summer of 2017. Brooklyn Farm's in 2016 from Google Maps. It seems that Clarimar took the store over again and by early 2018 was running a Food Universe Marketplace by Clarimar, according to the storefront's sign. Food Universe is a Key Food banner. The store was still celebrating its grand opening when I visited at the end of February 2018. 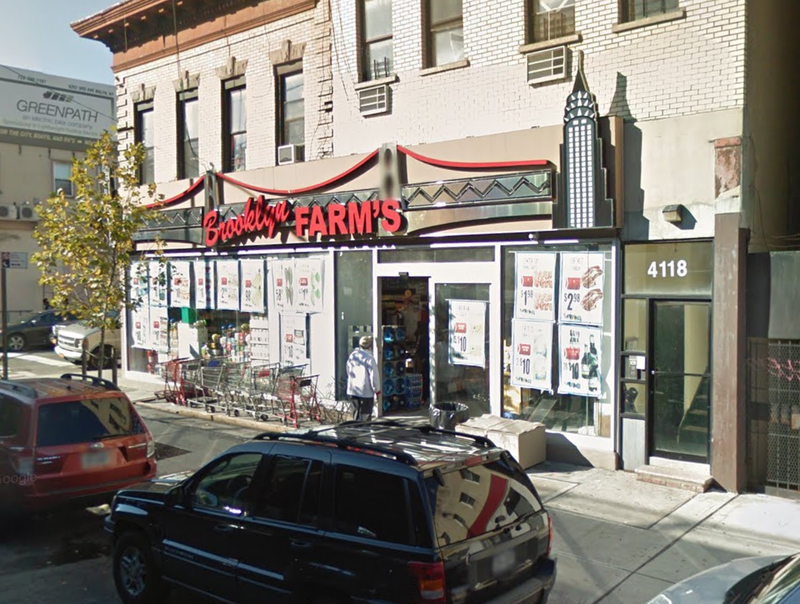 Brooklyn Farm's did extensive renovations to the space, including moving the entrance to the right side of the storefront (behind the truck) and installing new windows. Food Universe is taking full advantage of the fact that the store is on a corner by putting their logo on both sides and on the corner, which no previous tenant had done. Not sure what's behind the rolling door here, but it's not the most beautiful. Here's another shot of the exterior, minus the tractor trailer. Very festive exterior. I don't think this store is very visible from the interstate above, but if there's anything that would make it, Food Universe did it! You enter on the right to a small deli department, with produce behind. Meat runs along the back wall and dairy is in the last aisle. The manager's office is above the deli. I hope the deli clerk isn't too tall! Here we can see the deli and the entrance. Produce lines the wall to the left here, while frozen foods run along the facing aisle. Nice and spacious produce department for a very small store. 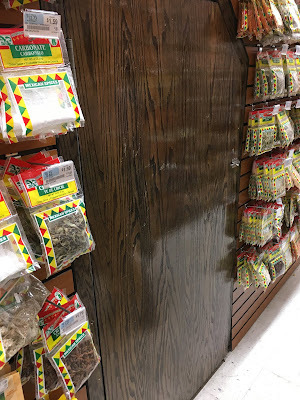 The store is bright and spotless, and I like the colors on the walls. These freezer cases also look quite new. The rest of the grocery store continues on the other side of the freezer cases. The selection in the produce department was also very extensive for a very small store. Continuing down the (very narrow) first aisle. You could get a normal-sized shopping cart down one of these aisles, but you couldn't pass one. Luckily the store didn't seem that busy. 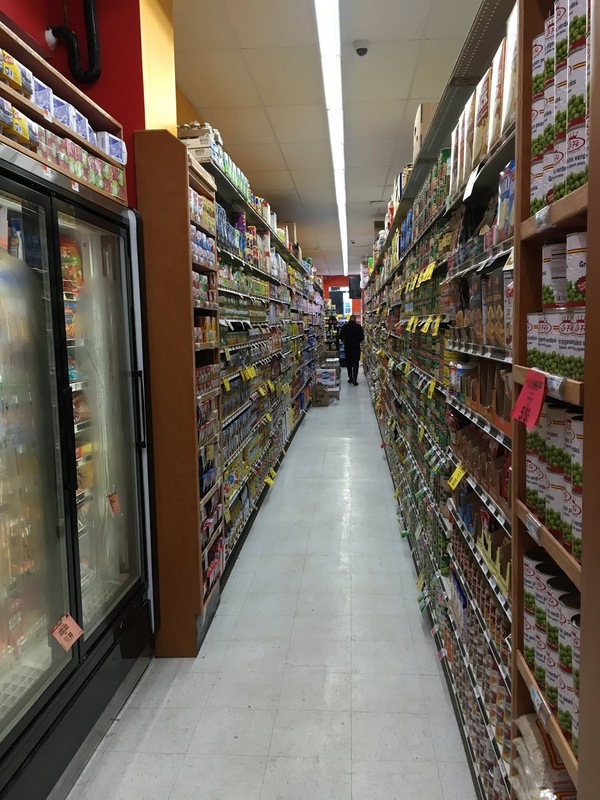 Here's a quick look at Key Food's new storebrand, Urban Meadow. The packaging is much nicer than the old Key Food brand, but it's not uniform among all the Urban Meadow products, which bothers me. A look at the meat department along the back wall. The store is deeper than it is wide, but it's still tiny. Continuation of the freezer cases into one of the aisles. The store, as you can see from the exterior views, is actually two separate buildings that have been combined. You can clearly see the dividing wall here, as well as in the meat picture above. And this store is clearly not for the claustrophobic. Meat, looking from the far side towards the produce aisle. The last aisle contains dairy and bread. Plus a huge selection of dried spices and herbs, as seen in front of the yellow wall here. Hidden in the middle is what appears to be a freight elevator to the basement, where the backroom space is located. Here's the door (well disguised) to the basement. Dairy continues on the other side of this column. Food Universe is the banner under which Key Food's two corporately-owned stores operate, and it's the up-and-coming banner as well. This means that there's a little more stuff to the Food Universe banner than some others, such as these reusable bags being sold at the register. Going on the website fooduniversemarketplace.com will redirect you to the homepage of Key Food with the Food Universe logo replacing the Key Food logo. The Food Universe banner was introduced in 2014 primarily for acquired stores from Associated Supermarkets during their bankruptcy, although it's been expanded to include other operations as well. Today there are 36 Food Universe stores. This particular Food Universe was clean, bright, and well-stocked, although rather cramped. However, I'm willing to sacrifice general spaciousness for increased selection overall. Good luck to Food Universe by Clarimar!